Offer something unique and unusual. Here is your chance to give your love ones the world! Just choose these adorable utensil favors and skys the limit on fun. 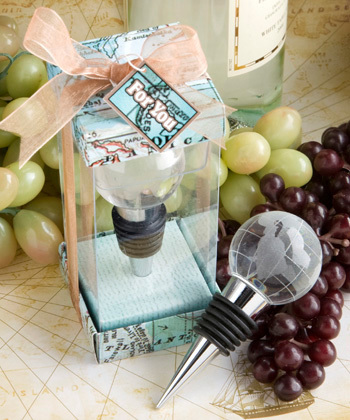 From the Global Love Collection, each chrome finish silver metal wine bottle stopper favor measures 4" x 1.25" and has a conical base, wrapped with a black rubber gasket, topped with a clear glass globe, with the world design etched in white. Fun and fitting as destination wedding favors or for any travel-inspired occasion and much more, each globe themed favor comes in a vertical box with an acetate window middle and a fun map design base and top and an ocean design staging insert, tied with a bronze ribbon and a matching map design "For You" tag.